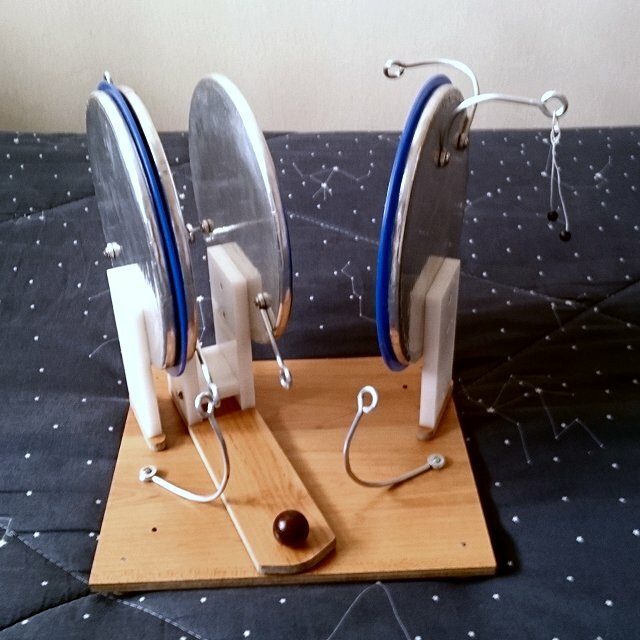 In April 2015 I built this machine, that is a different version of Wilson's machine, having the same operation but with a symmetrical structure. As with this construction it resembles a pair of "electrophori"one charging the other, I decided for the name above. 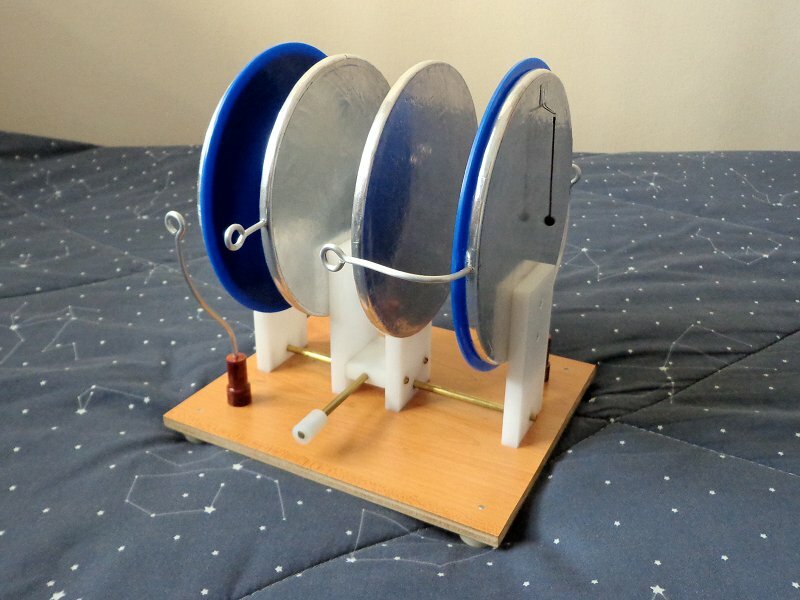 The machine has four conductive plates mounted on insulating supports, making two variable capacitors that can change capacitance in alternate way, as the two central plates are moved in the direction of one or of another of the two fixed plates at the left and right sides of the device. At the ends of the movement the central plates touch each a contact. The plate closer to one external plate touches a grounded contact, and the other touches a contact going to the same external plate. The picture below shows how the charges in the plates ideally increase, starting from an initial charge in one external plate. Starting from the initial configuration (a), the first cycle ends in (c) with the charges in plates A and B doubled. The next cycle, however, due to the charge present in plate D in (d), results in 5 times more charge. The sequence for the charge in plate A is then Q, 2Q, 5Q, 13Q, 34Q, 89Q, 233Q, and so on. In plate D the corresponding charges (when in the positions at left) are 0, -Q, -3Q, -8Q, -21Q, -55Q, -144Q, and so on. By dividing one charge by the previous in the same plate, it's seen that the multiplication factor at plate A starts at 2 and tends to 2.618 after several cycles. In plate D it starts from infinity and falls also to 2.618 after several cycles. The machine is then more than a "doubler". Note that this ideal multiplication factor is only achieved if the capacitance variation is large, and the self-capacitances of the plates when isolated are significantly smaller than the maximum capacitance between a pair of plates. 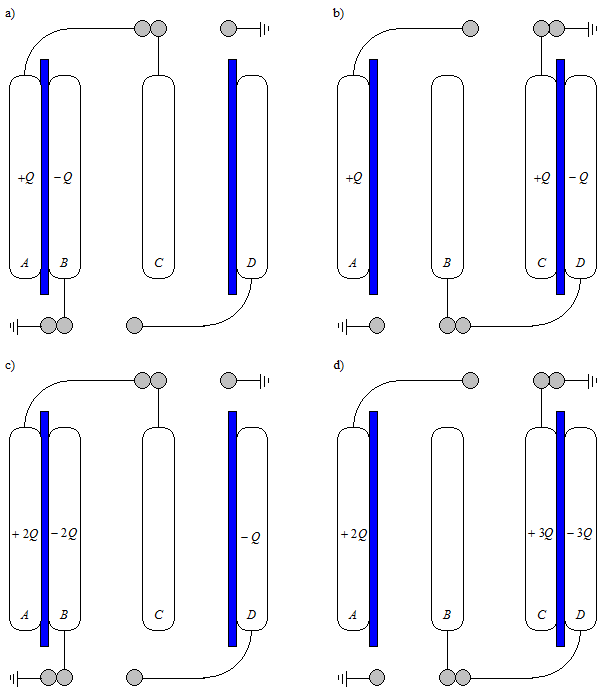 A variation of this same machine is described in a patent , with the two variable capacitors varying simultaneously instead of in complementary way. In that way the multiplication factor is smaller, and the self-capacitances of the fixed plates must be large, or discrete capacitors must be attached to them. The machine described here works also with diodes instead of switches, as in the patent. The 15 cm plates are made of fiber boards covered with thick aluminum foil, glued to them with contact glue. The insulating supports are made of HDPE boards, and the contacts with aluminum wire. A brass guide bar keeps the central plates in position as the central part is moved back and forth, with the help of a handle attached to the central structure. The ground terminals are interconnected below the base by a metal strip (actually not necessary, but improves a bit the performance, as the MDF base is not very conductive). Two acrylic disks are glued to the to outer disks as spark shields and movement limiters. 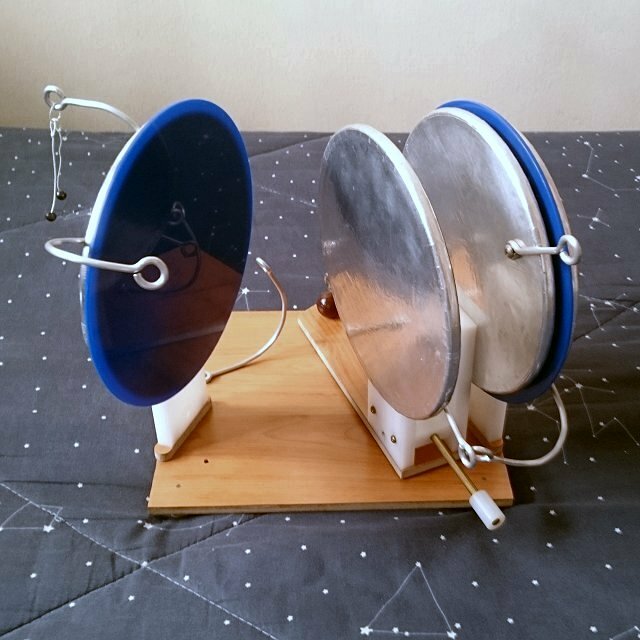 Two electrometers are mounted at the two fixed plates for visualization of the charge. Top view. The mechanical system is not very good, having significant friction. 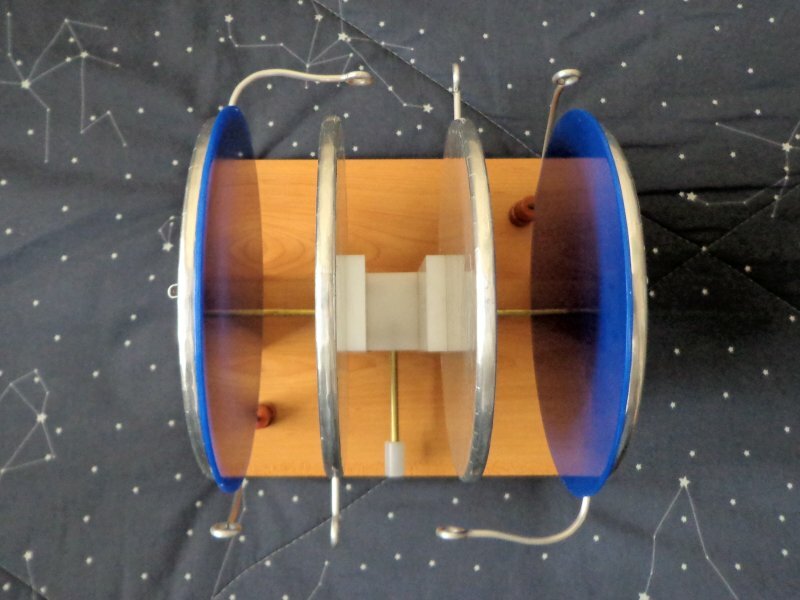 Little wheels could be added to the central structure to facilitate the movement, or the plates could be mounted differently, in a rotating structure. The machine is self-starting, and gets charged quite suddenly after a few cycles, reaching about ±10 kV. At the limit corona from the connection wires, imperfect edges of the aluminum foil, and the electrometers limits the voltage growth, and can be heard and even seen in the dark. The insulation of the supports is not very good, due to their large surface area, and the machine loses the charge in little time. By April 2016 I changed the structure of the generator, replacing the sliding movement by rotation around a pivot, more convenient for operation. I changed also the way to attach contact wires to the disks, using screws instead of just inserting them in holes at the edges, to solve constant bad contact problems and excessive leakage. I added extra ground contacts in the disks too for easier adjustment.